Go home or go on? Care to walk a mile in my ant filled shoes? Your photography trip II – Where should I go? Thick-tailed scorpion (Tityus sp.). Photo from the Cauca Valley, Colombia. Copyright Paul Bertner 2018. Photo was taken with a Nichia 365nm UV flashlight. These photos must be taken in the dark, otherwise the the light will overwhelm the UV fluorescence. Shot on a tripod with mirror lock up and 2 sec self timer. Shutter speed was 30 seconds, aperture f/9, Iso 200 and no flash. While the shutter is open I painted the subject with the UV beam, careful to illuminate as evenly as possible the entire subject. One must choose a subject that does not move for at least 15-30 seconds to get a blur free image. 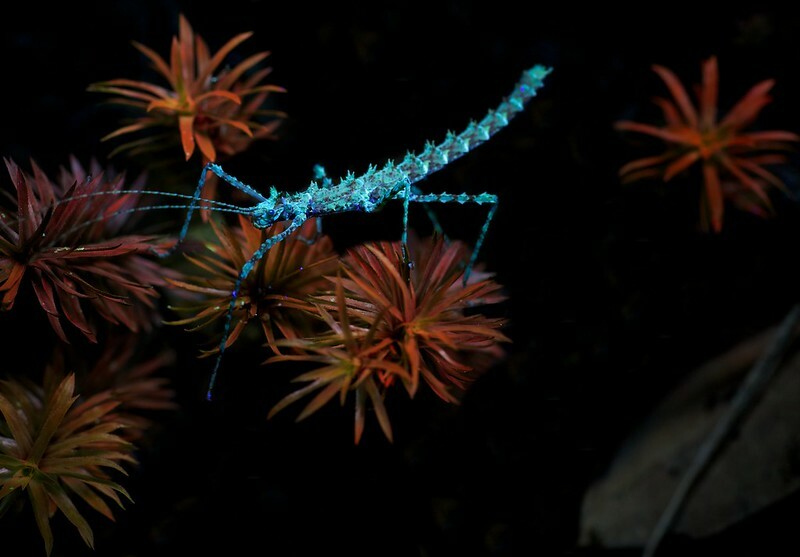 Notice that both the stick insect and moss (green under visible spectrum) is fluorescing. Photo taken in Kinabalu national park, Borneo. Copyright Paul Bertner 2014. Despite the exotic flavour of UV fluorescence and photos translating this otherwise unseen world into something visible to us, UV is a commonplace, naturally occurring phenomenon. It is a world operating under our noses which passes unseen at wavelengths (𝜆) below the visible spectrum (400-750nm) to which our eyes have evolved. In theory this spectrum ranges from 1-399nm. At the lower 𝜆s (1-120nm) there is enough energy to cause ionization (gaining/losing of electrons) of atoms. Within the upper UV-range, although lacking the ability to ionize, there remains enough energy to excite molecules and cause ensuing chemical reactions, amongst them fluorescence. For the purposes of photography the practical range is in the 200-399nm range, the so-called near-UV spectrum, below which air and lens glass is opaque to UV. Closer to the 400nm 𝜆 and there is a distinct purple or blue cast to the light which can be an indicator of the 𝜆 used. Around the 365nm 𝜆 at which most other UV lights operate, there is no colour cast. However, different substrates fluoresce optimally at different 𝜆s, and so a subject that might fluoresce at 300nm might not do so at 365nm. Having said that, most subjects will also display a range or overlap, and it is simply a case of how close you are to the ‘sweet spot’ that will determine how bright the subject will appear and hence how long of an exposure will be needed in order to display the fluorescence effectively. The near-UV light is further sub-divided into long wave or UV-A (320-400nm), medium wave or UV-B (280-320nm) and short wave or UV-C (200-280nm). However, in practice this means little since most photographers will be limited to the 𝜆s of commercially available UV-flashlights which mostly fall in the 365-400nm range, anything other than that falling into the realm of a specialty product, with concomitant specialty prices. UV fluorescence ranges across kingdoms, from the UV absorbing nectar guides of flowering plants (which serve to guide pollinating insects to the energy-rich nectar but more importantly to the reproductive organs of the plants to ensure fertilization) to fluorescing bacteria, fungi, protists and animals. Lichens under UV light. Photo from Mindo cloud forest, Ecuador. Copyright Paul Bertner 2011. Gecko (Cyrtodactylus sp.) under UV light. Photo from Mt. Kinabalu national park, Borneo. Copyright Paul Bertner 2014. 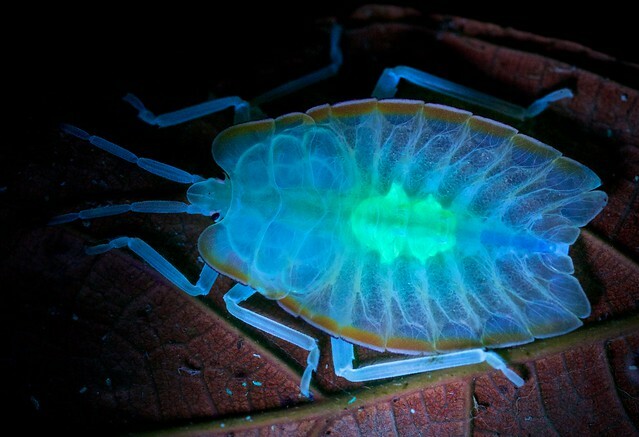 It is the latter case, specifically UV fluorescence amongst the arthropods which will be the focus of this section. 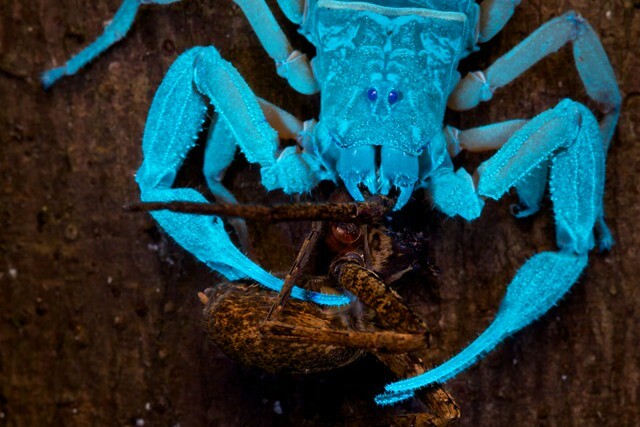 I, like many others had already known about the build-up of molecules in the chitin of scorpions produced during the oxidative cross-linking process, sclerotization, which fluoresce under UV light. Specifically, “β-carboline — a tryptophan derivative that has previously been identified by hydrolysis and oxidation”. 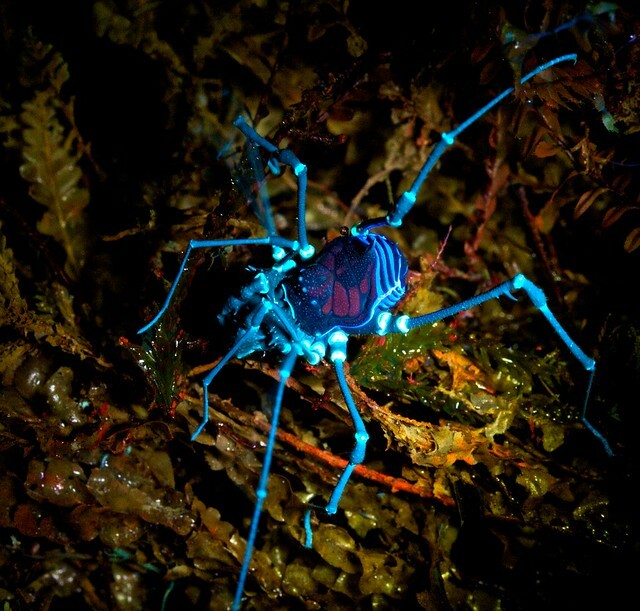 However, thanks to Techuser (Joao P. Burini) I was exposed to the idea of using UV light on harvestmen (Opiliones). 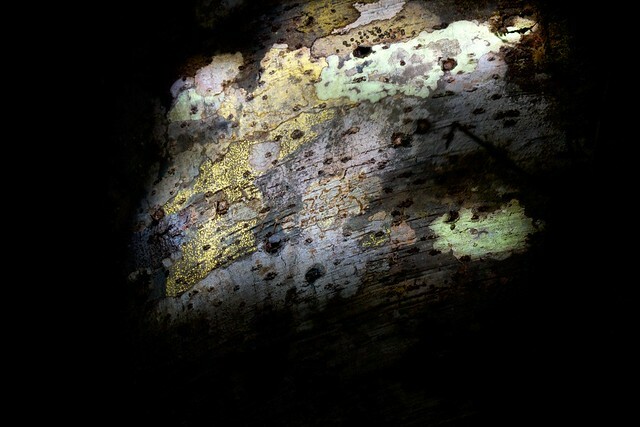 From there I began experimenting, firing a brief UV pulse at any potential subject and was surprised at the breadth of flora and fauna showing a biologically significant degree of fluorescence. In scorpions, the most studied example, there is still no consensus with respect to the function of fluorescence, though theories abound. 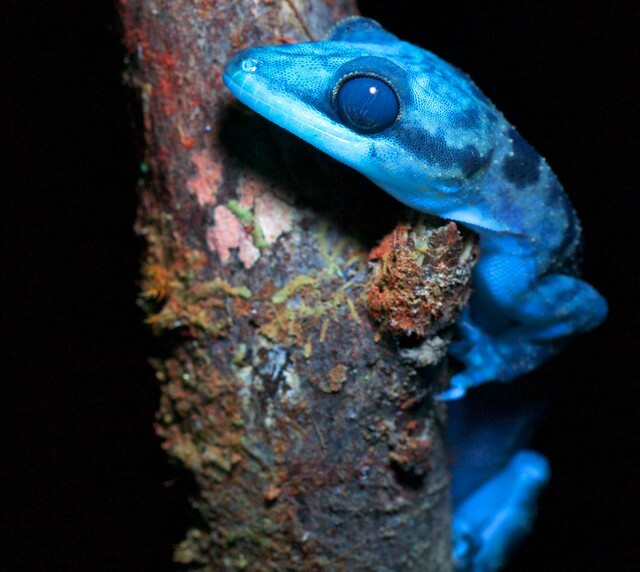 They range from the accidental – the fluorescing molecules are a simple byproduct of other, more important chemical reactions, to behavioural – interspecific recognition, prey attraction or aposematism to predators. Perhaps one of the most intriguing theories, proposed by Carl Kloock et al., is the indirect use of UV-sensitive molecules, whose induction is then transduced into the blue-green 𝜆 (450-570nm), the same 𝜆 at which the eyes show peak sensitivity and to which the scorpion brain is hardwired. 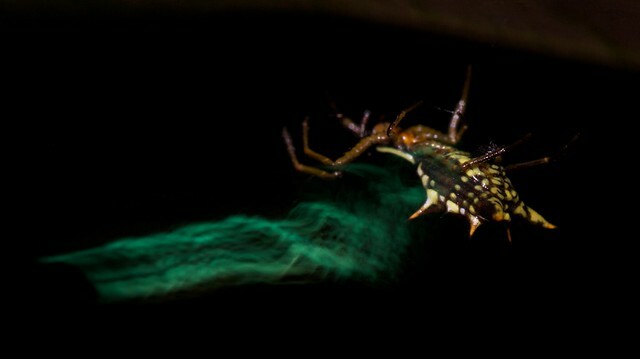 Experiments with blue-green and UV light have shown that these UV-sensitive molecules in the surface cuticle effectively turn the entire body into a photon collector, enabling the scorpion to determine its immediate environment, a matter of great practical concern for finding shelter and predator avoidance. 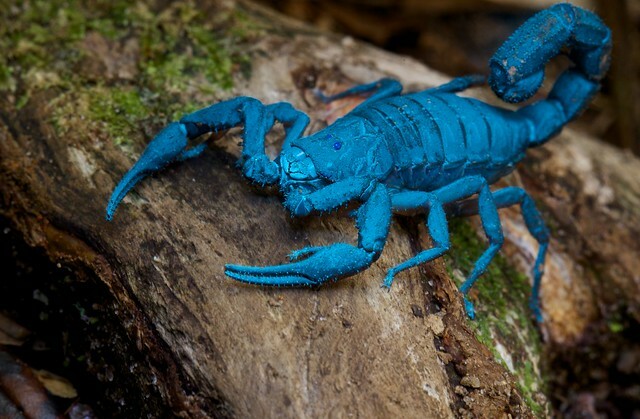 Scorpions are the original ‘blacklight bugs’ (yes I know they’re arachnids). They respond very strongly to UV light and unlike a lot of other insects they don’t require the lengthy exposure times needed to bring out that fluorescence. Photo taken in Bukit Barisan national park, Indonesia. Copyright Paul Bertner 2013. 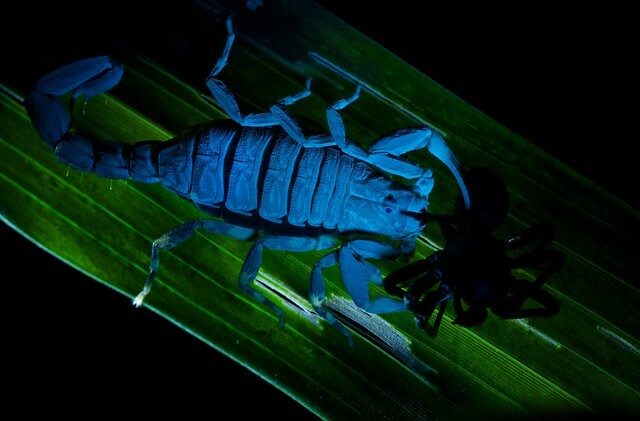 Scorpion (Babyurus gigas) with prey under UV light. Photo from Amani nature reserve, Tanzania. Copyright Paul Bertner 2014. 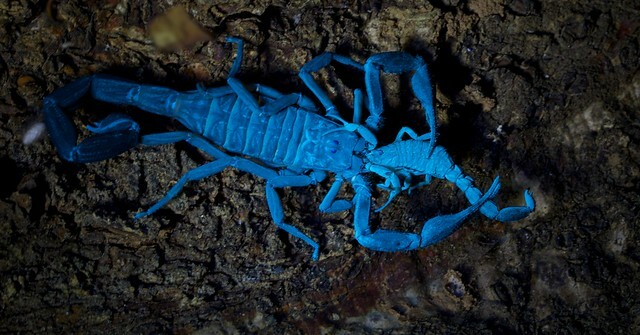 Scorpion cannibalism under UV light. Photo taken in Udzungwa national park, Tanzania. Copyright Paul Bertner 2014. UV fluorescence seems to change with the life cycle, either becoming stronger of weaker with age depending on the species and pre- and post-ecdysis. 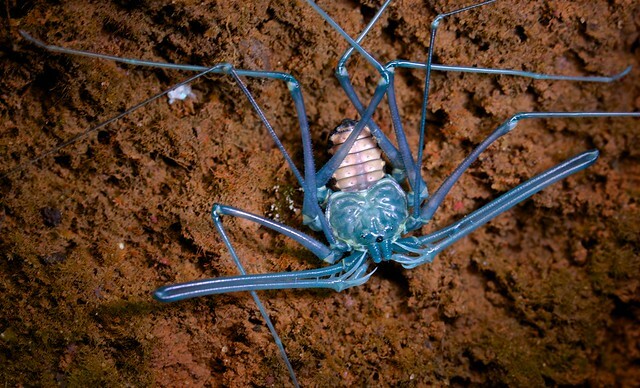 For example one individual of a newly moulted amblypygid showed fluorescence while adults and even juveniles that had already hardened exoskeletons displayed no such fluorescence. 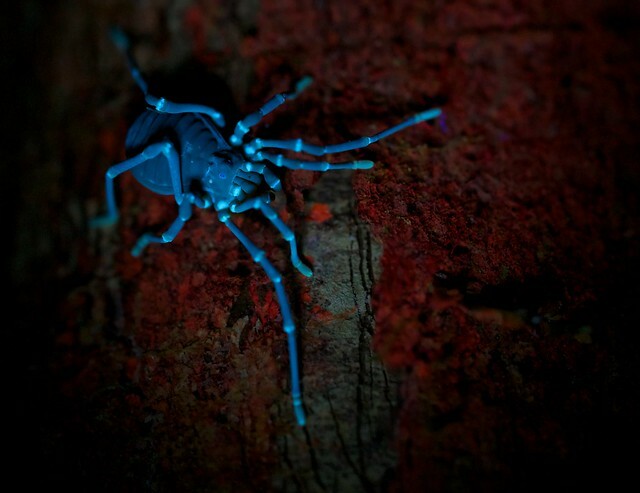 Amblypygid (Euphrynichus amanica) under UV light. Photo from Amani nature reserve, Tanzania. Copyright Paul Bertner 2014. 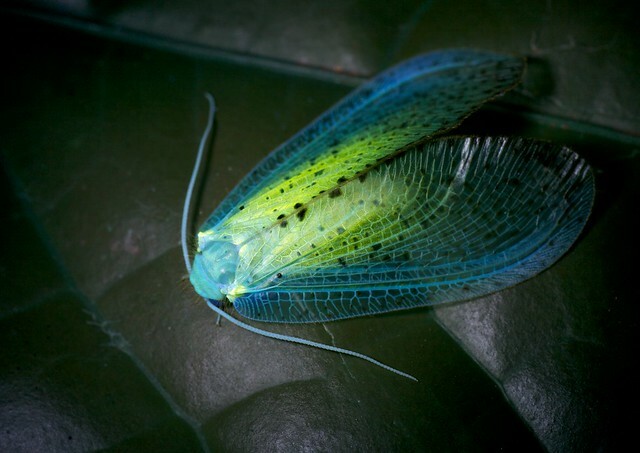 Other insects and arachnids display either a more limited fluorescence, multi-spectrum fluorescence or else a fluorescence which manifests itself as differential patterns. For these cases, alternative explanations must be found. Some theories include interspecific differentiation or mate selection, and aposematism in nocturnal predators (in a similar way to how bright colours in the visible spectrum do to diurnal predators). For example, harvestmen use a variety of defences, including aposematism, stridulation and chemical defences to ward off predators. So it seems feasible that such fluorescence might fulfill a similar role. 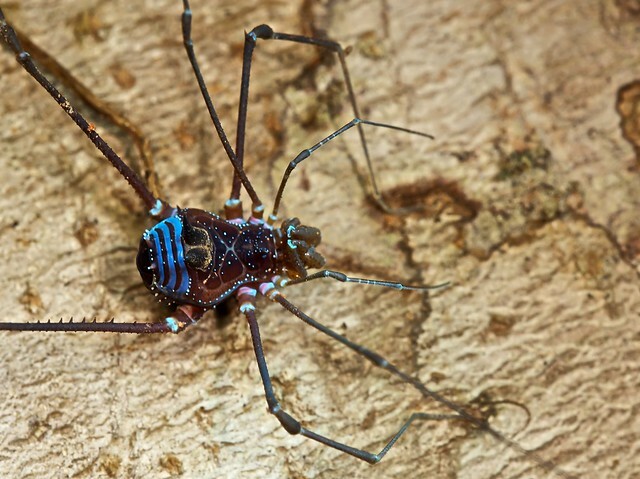 Though the bright, obvious patterns on the dorsum and posterior might be more reflective of mate selection since many harvestmen will perch up high and with relatively poor vision, such evident colours and patterns might help them find a mate or rivals. Cranaeid harvestman from Bigal River reserve, Ecuador. Copyright Paul Bertner 2018. Cosmetid harvestman from the Tambopata Research Centre, Peruvian Amazon. Copyright Paul Bertner 2018. Here the entire harvestman is fluorescing rather than showing any patterns. Note the normally green lichens fluorescing red. Photo from Danum Valley, Borneo. Copyright Paul Bertner 2014. Harvestman showing patterns on the rear of the cephalothorax. Photo from Cloud forest, Ecuador. Copyright Paul Bertner 2011. Harvestman showing banding patterns on the rear of the cephalothorax along with spots and narrow bands on the pedipalps. Photo under UV light with brief flash burst. Photo from Cloud forest, Ecuador. Copyright Paul Bertner 2011. Cosmetid harvestman under UV light. Photo from Leticia, Colombia. Copyright Paul Bertner 2017. Harvestmen with eggs under UV light from Mindo cloud forest, Ecuador. Copyright Paul Bertner 2017. 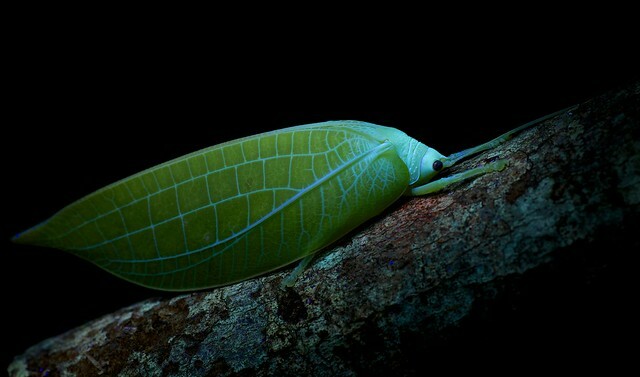 Leaf-mimicking katydid (Pseudophyllinae) under UV light. Photo from Mt. Kinabalu national park, Borneo. Copyright Paul Bertner 2014. Female leaf-mimicking katydid (Typophyllum sp.) under UV light from Finca Las Piedras, Peruvian Amazon. Copyright Paul Bertner 2018. Female leaf-mimicking katydid (Typophyllum sp.) under UV light from Jatun Sacha reserve. Copyright Paul Bertner 2016. 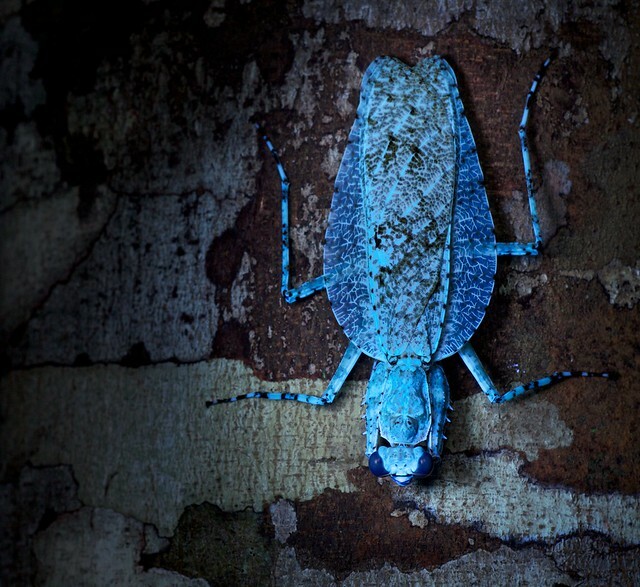 Lichen-mimicking katydid under UV light. Photo from Sani lodge, bordering Yasuni NP, Ecuador. Copyright Paul Bertner 2017. Though blue or indigo is the most commonly encountered fluorescence, I have also seen green, purple, yellows and reds. Stick insect. Photo taken in Danum Valley, Borneo. Copyright Paul Bertner 2014. Mossy stick insect. Photo from Andasibe national park, Madagascar. Copyright Paul Bertner 2015. Limacodid caterpillar (Narosa sp.) under UV light. Photo from Cuc Phuong national park, Vietnam. Copyright Paul Bertner 2014. 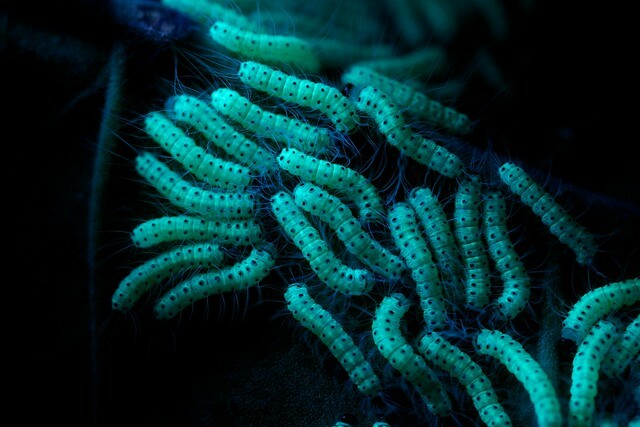 Caterpillars under UV light. Photo from Cuc Phuong national park, Vietnam. Copyright Paul Bertner 2014. 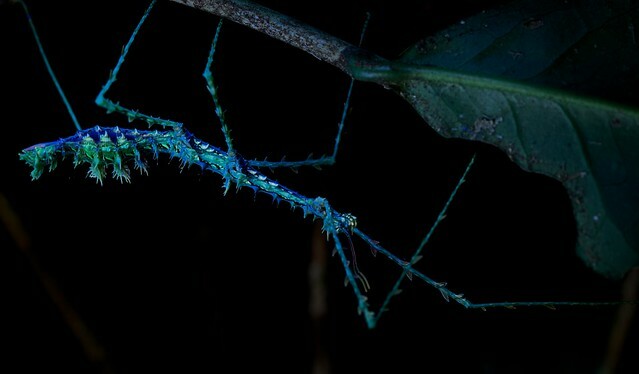 Lichen mantis (Theopompa borneana) under UV light. Photo from Danum Valley, Borneo. Copyright Paul Bertner 2014. Stink bug (Tessaratoma sp.) under UV light. Photo from Cuc Phuong national park, Vietnam. Copyright Paul Bertner 2014. Moth-lacewing (Rapisma sp.) under UV light. Photo from Mt. Kinabalu national park, Borneo. Copyright Paul Bertner 2014. 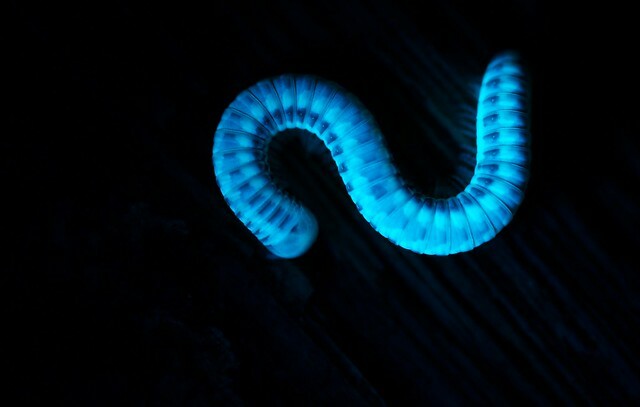 Millipede under UV light. Photo from Cuc Phuong national park, Vietnam. Copyright Paul Bertner 2014. Tortoise beetle (Acromis sparsa) with young under UV light. Photo from Taironaka lodge, Colombia. Copyright Paul Bertner 2018. Ground chameleon (Brookesia superciliaris) under UV light. Photo from Ranomafana national park, Madagascar. Copyright Paul Bertner 2015. Mushroom (Marasmius sp.) 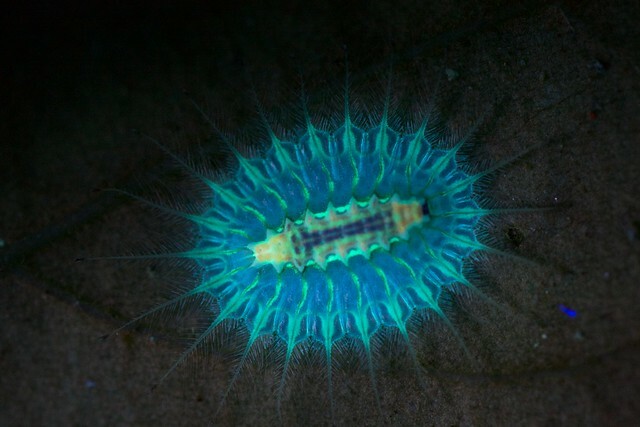 under UV light from Palmari reserve, Brazilian Amazon. Copyright Paul Bertner 2018. Most of the photos in this section involved the use of a tripod using anywhere from 2 to 30 second long exposures, while trying to minimize ISOs to 100-400. The results are much cleaner than attempts involving shorter shutter speeds with higher ISOs and larger apertures. Of course the caveat is that any movement will result in fairly poor results, like the crab orbweaver below. Motion from wind vibrating the web the subject was on made a long exposure shot impossible. Micrathena sp. under UV light with flash. Here, movement of the subject during a long exposure has resulted in the non-overlapping exposures of the subject under UV and flash. The UV exposure appears as the green/cyan streak. Photo taken in Ecuador. Copyright Paul Bertner 2011. The concept of UV photography is simple enough in itself. One must allow for a long enough exposure time to capture the rather dim fluorescence emitted by shining a UV light on the subject. 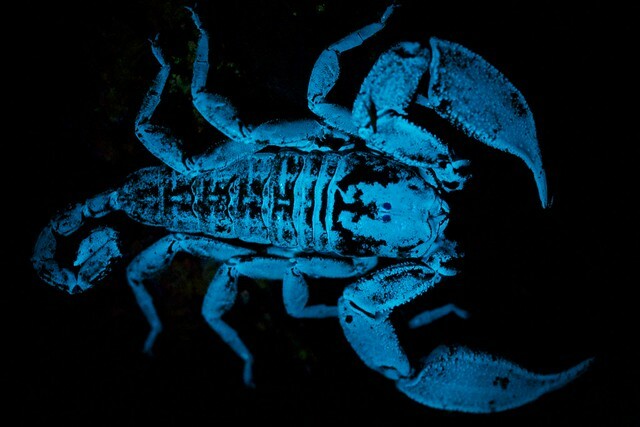 The amount of reflected UV light captured by the sensor will be the sum of exposure time, ISO, aperture, strength of the light source as well as the strength of reflected light from the subject itself (Scorpions reflect UV so brightly that shutter speeds as slow as 1/60″ can sometimes be used). Full frame sensors with their more forgiving high ISO capabilities are at a distinct advantage for this kind of photography. Exceedingly long exposures of 30″+ invariably lead to movement of the subject, or even the leaf or substrate on which it is resting and so is inadvisable with only a few exceptions. I generally tend towards the 3-10″ range, with ISOs no larger than 1600, even though black backgrounds mean that the graininess will be confined to a sharp in focus subject in which the grain is less apparent than in a smooth out of focus background. Too short of a shutter speed will also mean that you might not be able to evenly illuminate the entire subject with light painting. A slower shutter speed will allow you to go over the subject several times and not have hotspots, get underneath the subject to illuminate the underside, and focus on areas of importance like the head and/or other salient features. Either live view or else mirror-lock up mode will ensure that there is no mirror-slap which might also contribute to decreased sharpness. Fortunately all that’s needed is a UV flashlight or blacklight. All the photos here were taken with the aid of an ultraviolet flashlight (Tank 007) in the 365nm wavelength (I use the TK566 3W model). This provides a more naturalistic lighting that minimizes the purple colour cast of 400nm + wavelengths, though the latter definitely have an interesting, and distinctive look. Furthermore the increased wattage of a 3W versus a 1W model creates a brighter fluorescence, enabling shorter exposure times. Of course there is always the simple, cheaper way and then the complicated, expensive way of doing things. The latter requiring specialized UV passing filters (Baader BPU2 UV filter, $265), modifying the camera sensor to allow more UV light to pass ($150-200) and specialized quartz/fluorite lenses costing upwards of $4000 which also permit the passage of more UV light. Leaf-mimicking katydid. Photo from cloud rainforest, Ecuador. Copyright Paul Bertner 2011. The strength of the flash output will depend on both the strength of the UV reflectance of the subject and the exposure time. For this scorpion shot I was able to fire the flash at 1/2 strength due to the strong fluorescence, as well as the longer exposure time. Shorter exposure times will often mean that the UV reflectance will be overwhelmed, resulting in a standard non-UV shot. Scorpion under UV light with flash. Photo from Ranomafana national park, Madagascar. Copyright Paul Bertner 2015. Scorpion under UV light + flash from Sani lodge, Ecuador. Copyright Paul Bertner 2017. This is a careful balancing act, one must first have a translucent substrate which will permit the passage of light, while not allowing the light to overwhelm the fluorescence of the subject. If your flashlight has multiple settings, it is best to adjust it to the lowest lumen output and even then turn it on only briefly (or from further away) otherwise you risk too much light. Then follow the standard protocol for a normal UV image. Scorpion with zodariid spider prey under UV light with backlighting. Here the backlighting was provided by a Fenix LD20 flashlight turned on for only a second, while at the same time shining UV light from above. Photo from Udzungwa mountains nationalpark, Tanzania. Copyright Paul Bertner 2014. Though simple in execution, many people often neglect the principles of good composition while shooting UV, relying instead on the novelty factor to carry the image. This may be fine while UV is still on the fringes of photography, but if it becomes more popular or else is simply represented to a greater extent in searches and thus viewed by more people then it will cease to be novel and will be subject to the same rigorous standards governing a good photo. 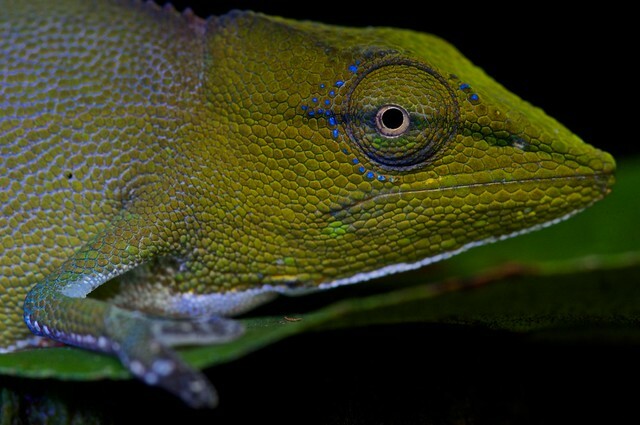 UV-induced fluorescence can be subtle as in the case of this chameleon which shows a ring of fluorescent scales around the eye. Chameleon (Calumma gastrotaenia) under UV light. Photo from Maromizaha reserve, Madagascar. Copyright Paul Bertner 2015. Or can be more dramatic as in this butterfly chrysalis which shows multi-coloured fluorescence. 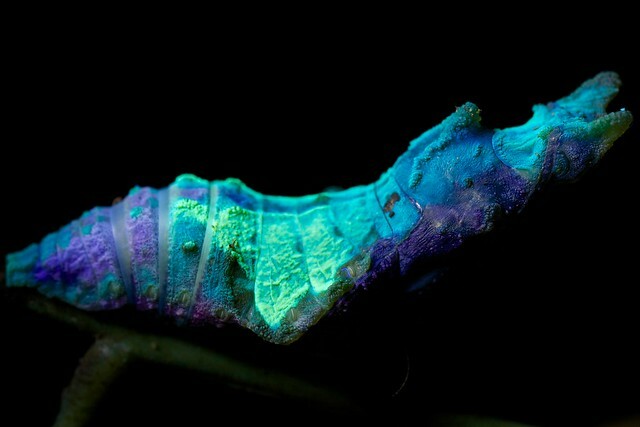 Chrysalis under UV light. 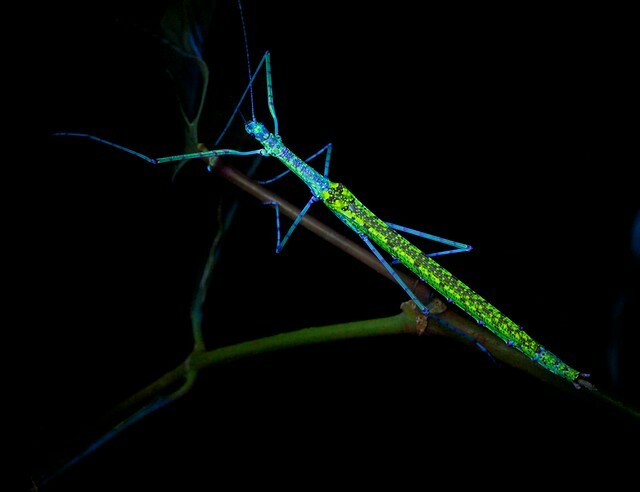 Many insects display UV fluorescence and this can sometimes come in unexpected and spectacular forms! Here, purples, blues and greens predominate although reds, yellows and other colours can also sometimes be found. UV fluorescence can appear in odd places, so it is always worthwhile to experiment and briefly inspect each subject you encounter with a brief UV pulse. Photo taken in Gunung Leuser national park, Indonesia. Copyright Paul Bertner 2013. A more extensive UV gallery including my earlier results can be seen in my Flickr album HERE. If you have any comments, questions or corrections, please leave a reply. Thanks for the fantastic images! Makes me want to try this.